Can you really judge a book by its cover? Maybe…or maybe not… There are hundreds of reasons why a product is preferred and picked over the others. I know the value of a product should be based on how it works/tastes but, are you like me – a bit of a sucker for delicious packaging!? The quality of a product can be well judged by its ‘appearance‘ and when it comes to food; the packaging should be appetising and aimed to strengthen the product’s key messages (or how I like to call them, the product’s storytelling attributes) that results in grabbing the attention of consumers and stimulating a purchase. When people purchase something with quality design, it sends a little subliminal message that they’ve made a good decision, and actually increases their opinion of the product regardless of how good it actually is. Now, more than ever, food packaging can be an expression of our mindset, identity, spirit, culture, and aspirations. The way a product carries its packaging gives a boost to its quality and value. When I pitch or put together concept visuals for a client, good food packaging should be designed in a way so as to satiate the aesthetics of a consumer so they will always be coming back for more, and is something that strengthens an everlasting connection the consumer with the product. Take a look at the way food products are presented in inspiring packaging; how the material is refined and having impressive quality helps to reinforce the business/brand’s message/story. Today’s blog post shares with you my top three most favourite packaging projects where I played part in creating the brand identity and retail packaging for your inspiration. Packaging is much more than ‘the box around the product’. It not only fulfills a lot of functions ranging from ‘protecting’ to ‘informing’ and beyond, but also plays a vital role in the supply – and added value chain of a product(s). 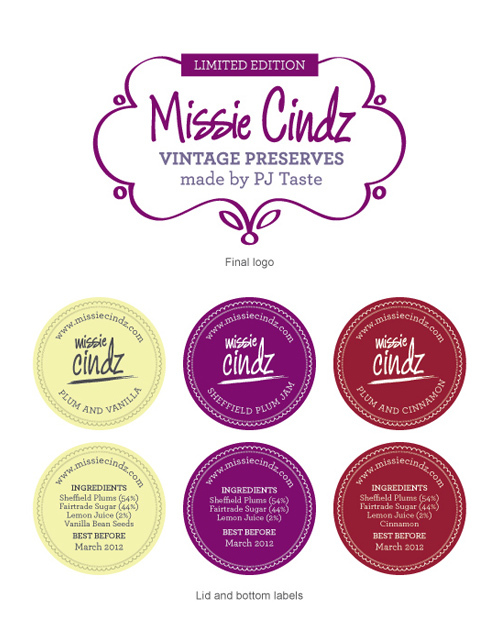 A collaboration with Sheffield-based caterers, PJ taste, to create my own Missie Cindz branded selection of hand-made jams, jellies, and preserves, under the name ‘Vintage Preserves’. Starting off with plum jam, where all the fruit used was grown in my garden at home in Sheffield and personally hand picked. The packaging was designed to give an organic and artisan-crafted feel, reflecting the Missie Cindz visual style in the branding, typography and material selection. There’s something cosy and nostalgic about the name of Vintage Preserves and I wanted the packaging to reflect a crafty, home made and traditional feel. The main jar labels carry a handmade, slightly whimsical quality. I had the labels printed on uncoated recycled paper for a more textured effect, contrasting against the smoothness of the glass jar and glossy circle ‘flavours’ labels. I deliberately kept the design of the labels simple, allowing for more freedom and variety in my decorating choices. A limited batch of 50 jars of Vintage Preserves Plum Jam in three wonderful flavours, Sheffield Plum (original), plum & Cinnamon and Plum & Vanilla was initially produced and stocked in the PJ taste shop. All sold out with further varieties planned. In December 2012, I collaborated again with PJ taste for the Christmas season to launch a special limited edition of delicious chutneys. Christmas dinner would not be complete without the customary condiment and we offered customers caramelised onion with burnt orange chutney a try, something different to the cranberry sauce! I created a lid label sticker for each flavour (defined by the ingredient colour) and months of the year, to reflect the fact that recipes and ingredients change with the seasons. 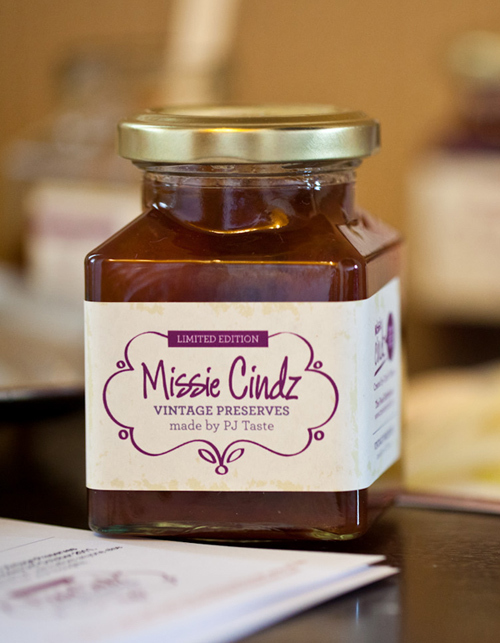 I worked closely with Peter of PJ taste, someone who I worked with previously on the Missie Cindz Vintage Preserves brand, to create a trusted new product. Rooted in Sheffield excellence, the Sheffield Egg doesn’t compromise on quality ~ the ploughman’s-style covering egg uses pork from Povey Farm in Sheffield’s Moss Valley combined with PJ Taste chutney and Yorkshire cheese with a dash of Henderson’s Relish gives a distinctive Sheffield tang, further emphasising the local heritage. Crucially, the egg is then tossed in toasted breadcrumbs and baked rather than deep fried – making it healthy too. I was asked to create a new brand that would offer an appealing ready-to-eat snack with stand-out presence, with a packaging and label design that needed to fulfill the predefined goals by PJ taste of provenance, whimsical and quality, all which had to be met within a nominal budget. It’s been a year since the first Sheffield Egg was cracked, the egg made it’s first appearance at The Sheffield Food Festival in 2012 and continues to have something fun about the brand, giving a sense of enthusiasm and creative flair in the PJ taste kitchen – which is something we always wanted to encompass in the product from the beginning. The PJ taste Sheffield Egg is currently available to purchase in their coffee shop on West Street and Urban Pantry Deli, Sheffield. The visual identity for the new ‘take-out’ sushi brand from Sushi Express needed to echo the owners’ huge excitement and enthusiasm for something that would wave goodbye to the expected traditional message synonymous with sushi, and welcome in new customers looking for a healthier take-out option. Packaging and labelling was key to promoting the real health benefit to consumers as well as communicating Sushi Express’s brand ethos of offering a wide variety of high quality sushi at affordable prices whether you’re looking to dine in or take away. I opted for a straightforward, honest design with attitude, where the product name speaks for itself. Photography is used to explain the product (individual sushi) quickly, encouraging hunger, and show convenience. Best of all, the use of imagery shows how delicious and fun nutritious food can be. I wanted to include an eye-catching, easy-to-display packaging system that also provided one-glance recognition of contents. The different colours are combined in a way to really stand out on the shelf. 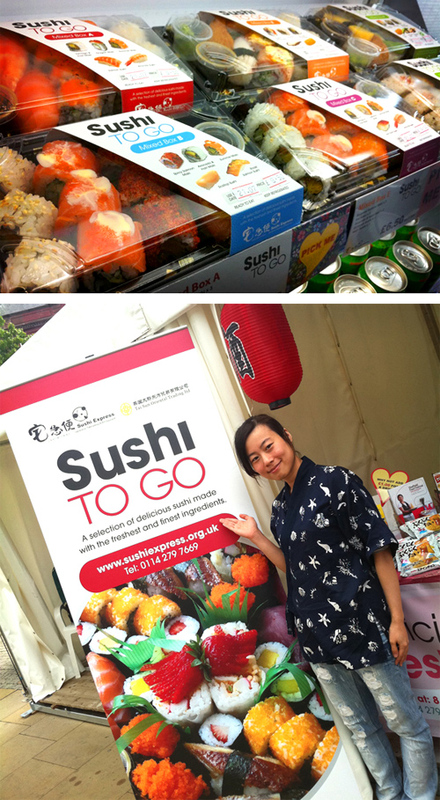 Sushi Express ‘Sushi To Go’ is currently available to purchase in their restaurant on Milton Street, Sheffield and in Tai Sun Oriental Supermarket. I hope you enjoyed me sharing some of my packaging case studies and find inspiration in them to apply to your own design work or service. What do you think makes successful food packaging design? ~ do exchange your thoughts and ideas by commenting below.